June 6, 2016 HockeyDraft.caLeave a Comment on Can the San Jose Sharks Actually Win? Can the San Jose Sharks Actually Win? 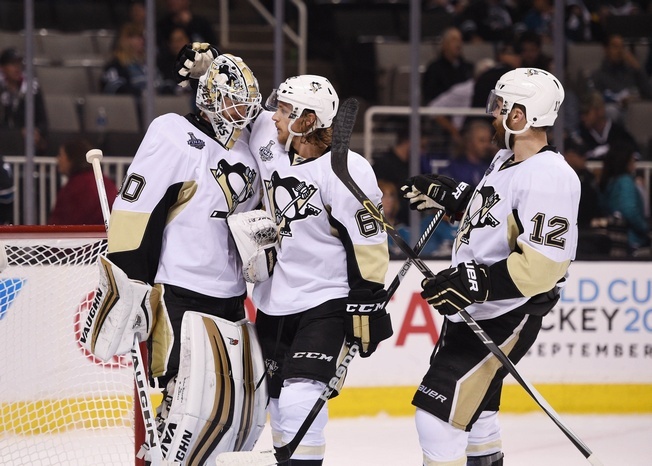 The Pittsburgh Penguins took a series stranglehold on Monday night with a 3-1 victory over the San Jose Sharks. They’re one win away from securing the Stanley Cup and the time has come to seriously question the opposition. While yours truly asked a lot of questions yesterday, the Penguins seemed to have all the answers in Game Four. Not only did Evgeni Malkin come alive with an assist and the game-winner, but Pittsburgh sealed the deal with effective performances from support players like Phil Kessel, Eric Fehr and Ian Cole. Yes, Ian Cole scored. It was the first career playoff goal for the 27-year-old blueliner from Ann Arbor and his first goal of any kind since late March of 2015. The Penguins scored first, improving to a 12-3 record in the playoffs when they score the first goal. San Jose ran into a little trouble in Pittsburgh netminder Matt Murray and only Melker Karlsson was able to score for the home team. With the Penguins rolling a deep roster and the Sharks struggling to get offence from Joe Pavelski, Patrick Marleau, Logan Couture, Brent Burns, etc., it’s not hard to see where this is going. Pittsburgh is the better team and San Jose has yet to play with the lead in the series. Three of the four games may have been close on the scoreboard, but it’s probably time to get used to the sight of the Penguins hoisting that Cup. If there is a silver lining to come out of Game Four, it’s that the Sharks outshot the Penguins for the first time in the series. They also had the edge in faceoffs and hits. Sidney Crosby sank to 42 percent in the dot, which may or may not quell Couture’s concerns. But the Penguins are in the driver’s seat. They’ve controlled play, run possession and taken over in terms of scoring chances. They are quicker, even with less-than-speedy skaters like Cole, Nick Bonino and Ben Lovejoy on the roster, and they’ve been blocking shots and containing chances. So what can be done, if anything, to extend the series for the Sharks? San Jose hasn’t done well playing a depth game. Their third and fourth lines have been easily handled by the Penguins. Ahead of Game Four, they outshot the Sharks’ third and fourth lines two-to-one. The Karlsson, Tommy Wingels and Nick Spaling line has drawn tough assignments and haven’t come up with much. San Jose’s third defensive pairing, Roman Polak and Brenden Dillon, have only hit 42 percent possession. They dropped below 40 percent in Game Three, the worst numbers of any pairing in the series. Sharks coach Peter DeBoer loses the matchup game as things swing back to Pittsburgh and that’s not good, especially when it comes to Crosby’s line. They’ve made mincemeat out of San Jose’s third unit and it’s not going to get any better from here on out. Things look dire for the Sharks and they may lack the depth and skill to get back in the series. San Jose hasn’t been able to keep up and shortening the bench may be their only option if they want to win matchups and score goals. They’ll have to ride their stars hard if they want to make a series out of it, but it’s getting harder and harder to see this matchup going on for much longer.